Japanese apartments --I was told-- do not have lights. "You will find this a little strange." Well, it did sound decidedly peculiar. In a country where the router stuffed in my back pocket gives me a 42 Mbps wifi connection, you'd think I'd be able to read a book at night. 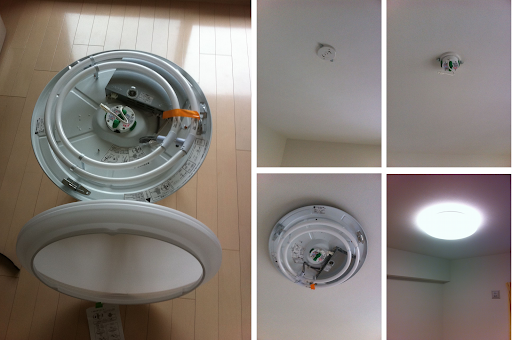 What I had presumed this meant was that Japanese apartments did not have central ceiling lights. This wasn't completely bizarre, since I had seen America apartments which were lit purely by lamps plugged into wall sockets. This gentler 'mood lighting' was sometimes considered preferable to the dazzling illumination of a single main light. Personally, I wasn't a fan of mood lighting. Either there should be light so I can see what is going on or there should be dark in which everyone disappears and I can get some sleep. Firstly, I did have normal spot lights in my kitchen, entrance way and bathroom. This was good to know since I saw disaster striking while I fumbled for a lamp to turn on when I came back at night. Secondly, there were plugs on my ceiling. Each room had a centrally positioned clip in the centre of its ceiling which was clearly designed to hold something electrical. This suggested it was time for an exploratory visit to a department store. The shop I picked had a wide variety of light fittings but the largest and most common were wide semicircular lights that clearly weren't supposed to stand alone. It was hard to examine the fitting, but it seemed highly likely that it would fit the ceiling plugs in my apartment. I bought a single one experimentally and zipped back home. Upon unpacking the light (left image), I found it had a detachable clip that did indeed plug into my ceiling socket (top centre and right images). Balanced slightly precariously on a stool, I plugged it in and then clipped the lamp on around it. There was a single wire to link the central clip to bulb and a smooth plastic shell to slide over the top. I jumped down from the stool and tried the light switch. Then I couldn't see anything for about 10 seconds. Probably shouldn't have been looking directly at the light when I did that. Nevertheless, success! Even if I was now blind. This particular light came with a remote control, so I can turn it off from my bed... when I get a bed. It even has a timer so I tell it to go out in 30 or 60 minutes. Ideal for fooling stalkers who might be hanging outside my 9th floor window. Clearly Japan is organised much more sensibly than the UK. There's no chance that the fittings would have matched in a similar English situation. Although you might have got it to fit in if you'd given it a whack. It's true -- I was pretty impressed with how easy (and more to the point, obvious) it all snapped together. I've not tried a different type of light though, I'm kind of curious to know if it's completely universal.